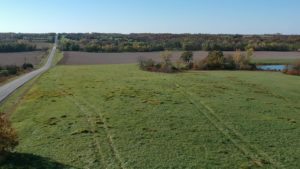 Land Sold in Gentry County, Mo. This farm sold and closed today in Albany, Gentry County Missouri. The farm was owned by the Grace Estate and had been in the family for multi generations. It was a beautiful tract overlooking a vast creek bottom and had views for many miles of the surrounding area. For anyone looking to build a home with a view or just a cabin for a weekend get away this was the perfect spot. As an added bonus it had annual income for many more years from the Conservation Reserve Program. There was also a nice large stocked pond for fishing and big enough to take a boat out on. The farm was located approximately 8 miles north of Albany on the west side of blacktop C with a gravel road along the northern border. There were enough trees along the border and down the draw above the pond to attract significant wildlife. For many years local hunters were always able to get the big buck which is typical of Northern Missouri. This land was almost the perfect scenario offering hunting, fishing, income and a unique building site with an unsurpassed view! If you are interested in a tract somewhat similar to this land that sold in Gentry County tract just click here! Or if you have land you are thinking of selling click here to contact us today! You can also follow us on Twitter and Facebook to stay up to date with our activity. One of the many ways we advertise to promote properties like this one is with the Saint Joseph News Press. Each Sunday we feature a “Farm of the Week” with a color photo on the front page of their Real Estate Section. We are one of the few real estate firms that still utilize print advertising to a significant degree. We also have a weekly full page color ad in the Cameron Shopper that is distributed to a four county area with a target population of 15,000. This is just a couple of the many areas we place print ads to market our properties. 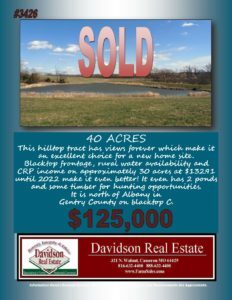 Davidson Real Estate has been selling land and farms in Northwest and North Central Missouri since 1996. 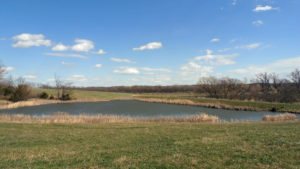 Call today if you have land to sell in Northwest Missouri.